Are you visiting Moscow? you get a metro card and jump on board to explore Moscow’s metro stations. The world knows the fastest trains is in Japan, the Shinkansen is an iconic transportation in the world. 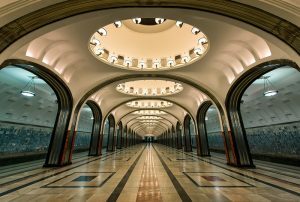 Russian also have iconic metro stations in Moscow. This capital city is famous with efficient and beautiful metro system. They are beautifully decorated, however still function as stations. Moscow has a busy vibe, you can enjoy the fashionable city street style even if you are traveling in on a budget. The metro stations system, it is a good way to travel to get from A to B. Most stations is at the city heart, near to some of Moscow famous places and various cheap and tasty market. Exploring the city also means you get to some of the classical Russian metro stations. So, don’t be a shock to see Soviet mosaic decorations, halls with chandeliers, colorful paintings, and impressive statues. To explore the city and the metro stations in Moscow, the best way is to have a map. You can go to a certain part of Moscow, get there in a short time and explore the nearby interesting places. There are many budget Hotel in Moscow close to the metro stations. Moreover, cafes and restaurants with top low budget meals scattered around the metro stations. Therefore, It is a good idea to explore the Moscow metro stations as a highlight of your trip. It is affordable, beautiful and massive. It almost you can skip visiting museums just by enjoying the metro stations. You can jump in from any stations will always amazed. Here are some of the most beautiful metro stations in Moscow. The ballroom metro station of Mayakovskaya will amaze anyone. The station has wide arches, huge domes with lamps and mosaic works from above with typical Soviet pictures. The yellow ceiling Komsomolskaya metro station is amazing. Moreover, this state of the art stop metro stations has black and gold mosaic around the picturesque ceiling. The enormous chandeliers enhance the classical vibes in this metro stations. The highlight of this station is its pillars. The main hall of Novoslobodskaya metro station has one of the most colorful stained glass decorations. The pillars have golden arches and the golden mosaic with various painting. In addition, most of the lady and baby illustrations make the drama complete. The long marble hallway has a magical twist that charm anyone. The most beautiful piece here is the beautiful chandeliers hanging on the ceiling. Moreover, it has an amazing ceiling with decorations, you can’t stop yourself to look up. Therefore, it is safe to say Prospekt Mira is an architectural masterpiece. This grand masterpiece metro station feels more like a museum. The prestigious arches, eight beautiful octagonal shapes of mosaics and marble walls take you back in time. Moreover, the dimps light create a classically romantic atmosphere. The star of Belorusskaya metro station, however, is the enormous statue of three men with long coats, holding guns and a flag. The “Soviet Belorussia” stand at the end of the platform as well as “Belarusian Partisans” statues. The metro station of Kiyevskaya is a bit narrower than other stations. However, the colorful romantic painting steals the show. It is the most romantic metro stations compare to than Belorusskaya and Prospect Mira. decorations. The halls of this station are quite empty, it only has a triangle light blue and white decorations that look spectacular. But the rest of the halls is quite empty and dull. You will not find any stations that look alike. This station has a clean cut decoration. The painting is not too colorful it plays safe with degrading color schemes. The common color in all stations are gold with huge golden mosaic covers one of the walls of Paveletskaya. The escalator will take you upstairs to have a better view of the turquoise dome and a painting of the St Basil’s Cathedral in a wooden frame. Modern stations that display porcelains, dolls, sculptures and act as seasonal exhibitions for various artist. Moreover, you can enjoy the tube glass display that holds sport or space exploration next to the bridge spanning the Moskva River. A very new metro station has a soccer theme panel. It mostly uses white and red color schemes. it is simple and sporty. It represents Russian love for the sport and also as a host for the last World Soccer Championships. Another sports theme metro stations in Moscow. The decor of the Dinamo station adopts Greece look. The pavilion pays respect to the birthplace of the Olympic Games. In additions, there are marble Corinthian columns with friezes and bas-reliefs depicting sports and competitions. It also displays medals and famous athletes. Coming to this metro is like looking at a sports museum. The world’s longest underground station before The Vorobyovy Gory metro station was built. The decorations use marble to covers the grey polyhedral columns. The chessboard floor with grey and white enhance a simple building. the This station is close to famous landmarks in Red Square and situated at Moscow’s main downtown streets – Okhotny Ryad. Leonid Polyakov built this station with seven Stalinist skyscrapers. The station has a rich elegant atmosphere with multicolored granite floor, pillars with white ceramic bouquets, and bronze chandeliers. Arbatskaya is next to the Defense Ministry headquarters and a suitable place that can play as an emergency bunker for military officials. There you have it, some of Moscow beautiful metro stations. You can visit various famous places in Moscow and enjoy their lovely stations on your way. It really gives a sense of art on the go when exploring the beautiful city of Moscow.